•	Go outside and play. •	Go outside and rake the leaves. •	Go outside and mow the lawn. •	Go outside and pick up the apples (we had two trees in our backyard). •	Go outside and shovel the snow. It’s no wonder I still go outside at every opportunity to center myself. Mom, you were right. We should spend time out-of-doors every day. 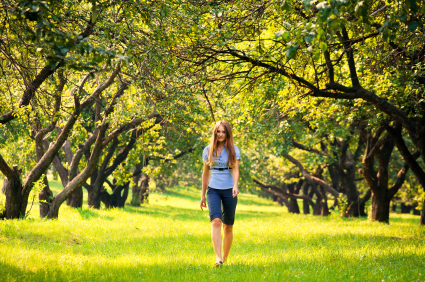 Every system in our body is dependent on oxygen, and fresh air is the best way to get it. Fresh air and sunshine are among the oldest, health-supporting concepts in medicine. They are essentially free antibiotics. During the Crimean War, Florence Nightingale slashed hospital death rates with a host of hygiene improvements – including throwing open the windows. Until she came along, soldiers were more likely to die from “hospital” than they were from their battle wounds. Today, despite a greater emphasis on cleanliness and sterile environments, patients still catch dangerous infections in hospitals. In the USA alone, 100,000 people a year die from hospital infections. In the 1970s, when energy conservation became a big issue, open windows that circulated fresh air were scuttled in favor of economical heating and cooling. Everything was sealed up, and thus began the era of “sick building syndrome.” Unfortunately, filtered air is dangerous because it circulates pathogens to an unnatural, dangerous degree. According to the Environmental Protection Agency, indoor air is twice as polluted as outdoor air. What’s even scarier? Americans from the age of 12 and up spend approximately 90 percent of their time indoors. Is There A Fresh Air and Sunlight Factor? Scientists are now acknowledging a connection between light and health. They’ve found that natural light has a very significant effect on our immune system. Light is currently used to treat various diseases of the blood and skin, and also for curing certain kinds of depression and nervous disorders. When sunlight shines on skin, the nerve endings absorb energy and send it throughout the entire body. A sensible amount of sun exposure nourishes and energizes the human body. It pays to learn from our heroes of the past. The World Health Organization recently published a report urging all healthcare settings to start using natural ventilation as much as possible, referencing Florence Nightingale. In Mumbai, India, an old-style sanatorium was refitted as a clinic with high ceilings and open porches for people with drug-resistant TB. Hospitals are finding a higher percentage of recovery rates of patients put in rooms that feature abundant sunlight; especially those that allow fresh air to circulate. It’s finally nice here, weather-wise, in Ohio! Take advantage of the warmer temperatures, abundant sunshine, and longer hours of daylight to get some fresh air and sunshine. Your body will thank you!